What's the best sentence out of these two conversations? "I'm glad that He is." Context can be everything. Being in a frightening situation is just that...frightening. However, when you know that God is control, that He is bigger than any situation, and that He is on your side...that's life-changing context. 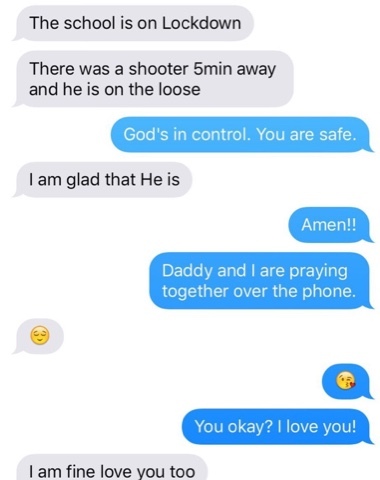 Any parent reading that text from their child would be alarmed but knowing that God is in control, that He is bigger than that situation, and that He is on our side...that's mind-easing context. Typing my response to G, I wanted to reach out to my wife and search online for a news update. Yet, I had a peace that my little girl was fine. She was safe. 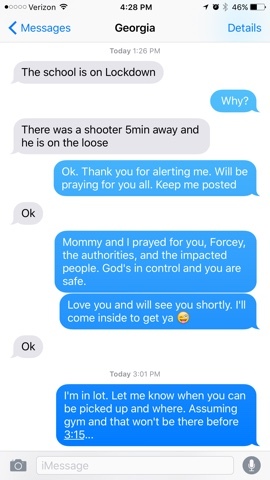 Frightening situations will come but I cannot imagine facing those without God's context.